I know many of you guys become pretty excited when I talk about recycling something that has also got some additional storage space or it might be used as a storage hack. The reason is pretty obvious for all of the urbanites who are deprived of larger plots for dwelling, they are just spending their lives in tiny homes and apartments. So anything offering some storage facility becomes an incentive. 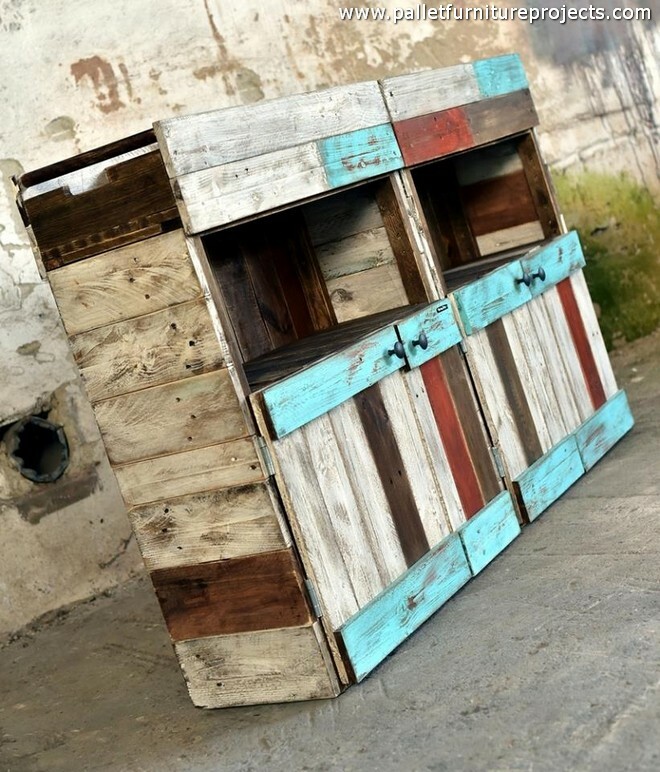 We bring here a pallet wood storage cabinet that is purely meant to provide you guys with a perfect and smart storage facility. Stuff inside the accessories which couldn’t make their place in the other furniture items so far. 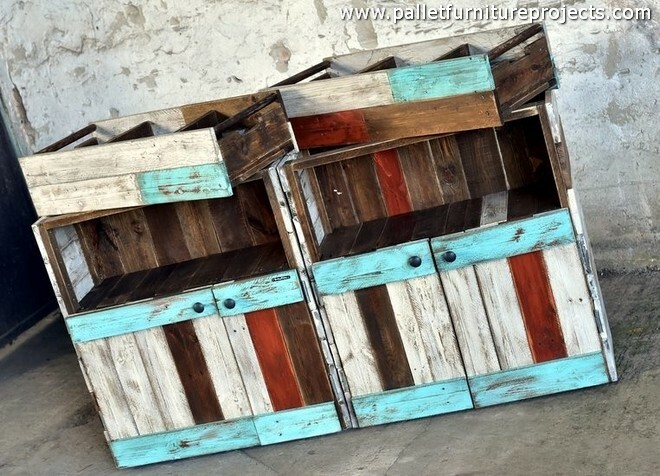 Let us begin with the quality of the shipping pallets that we have used in recycling this pallet wood storage cabinet. 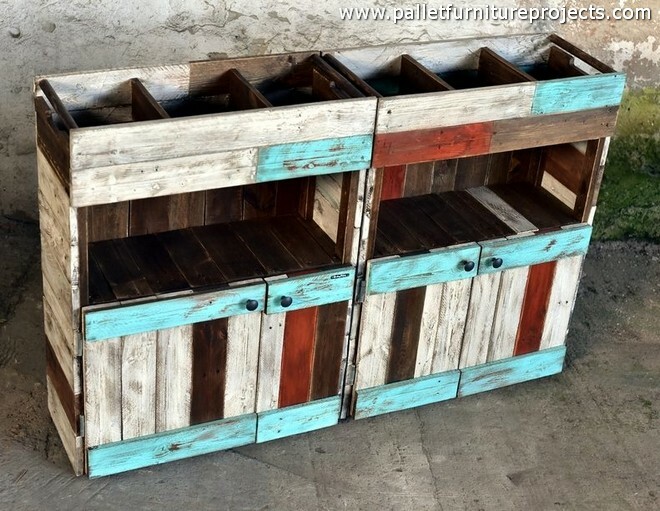 This is pretty apparent that the shipping pallets were collected from different sites and spots, and we didn’t bother to stain them so they carry the color what they sustained earlier. 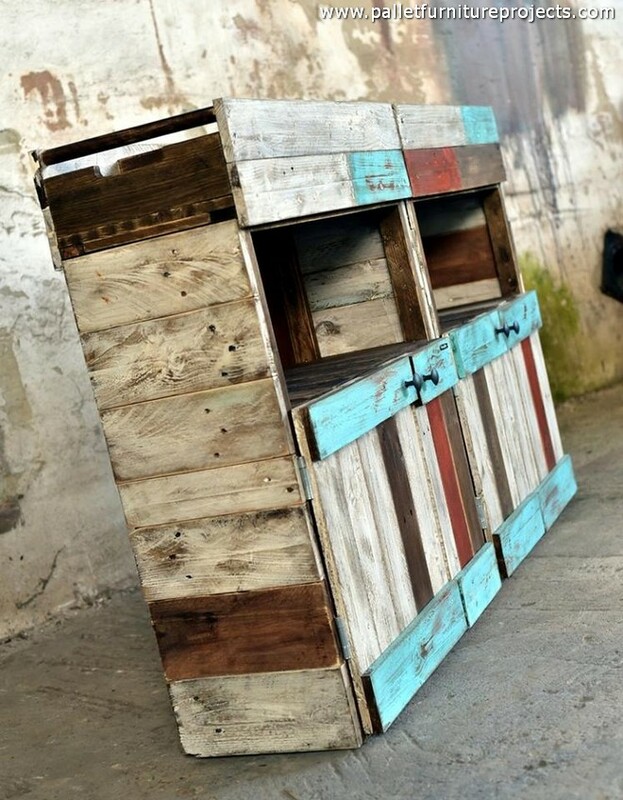 Most of our pallet wood creations are a basic inspiration for you guys to give you a basic and general idea. So we usually don’t bother about staining, we leave it upto you to select you favorite shade. 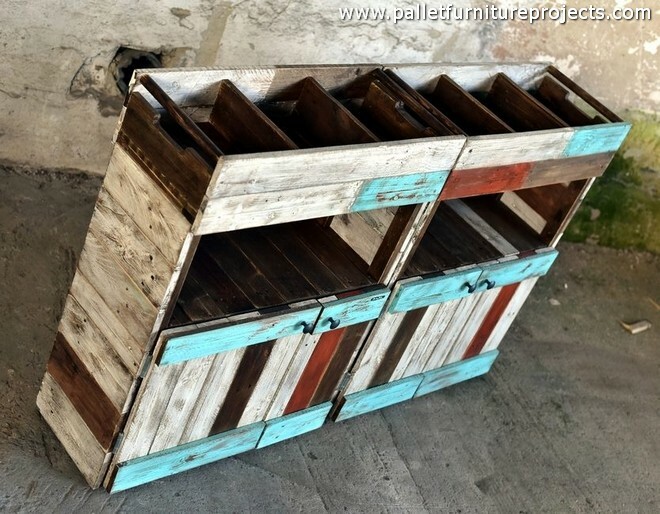 Now talk a bit about the design and shape that we have opted to make this pallet wood storage cabinet. 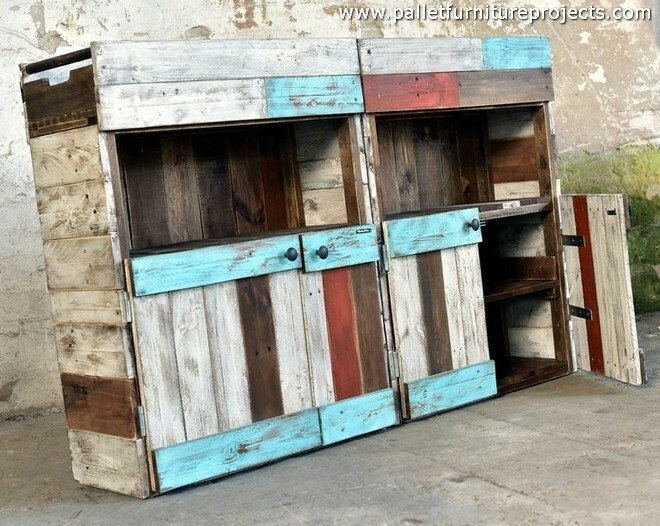 This is a grand dual door wooden cabinet with multiple racks and cabins. It has got plenty of space inside, plus a couple of large compartments that are gigantic enough to cater the storage need of an entire family. Having a look on the top of the wood pallet storage cabinet, we have created segmental space on the top of the cabinet, this is an additional smart storage hack. 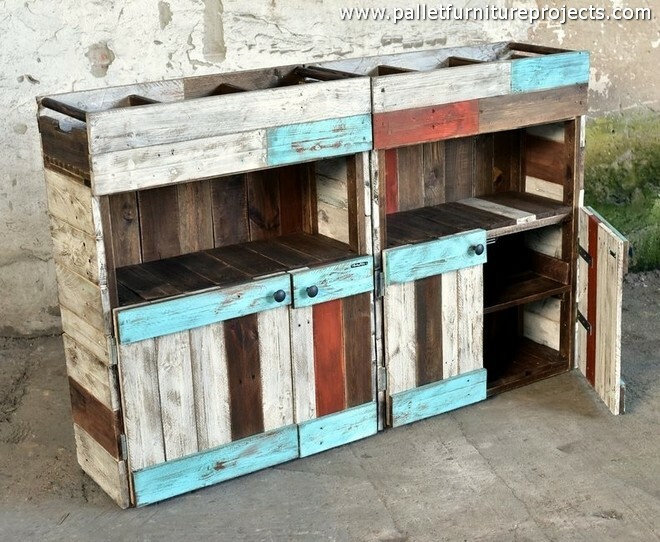 Put inside a number of accessories and stuff which exceeded the internal space of the wooden pallet cabinet.